Oil on canvas signed H.L. -65. Ascribed to Hilding Linnqvist. Paintings by Hilding Linnqvist have been sold for millions of Swedish crownes,(SEK) in Sweden. This painting is ascribed to Hilding Linnqvist, for information about the meaning of words in descriptions such as ascribed to, provenance and more -see Informations under company information, about us, about provenances! It is told that Hilding Linnqvist often painted his paintings almost like a piece of poetry with a serial of memories flowing out on the canvases at the same time without following any kind of order! -Please compare this description of Linnqvists way of treating a motive with this paintings composition! 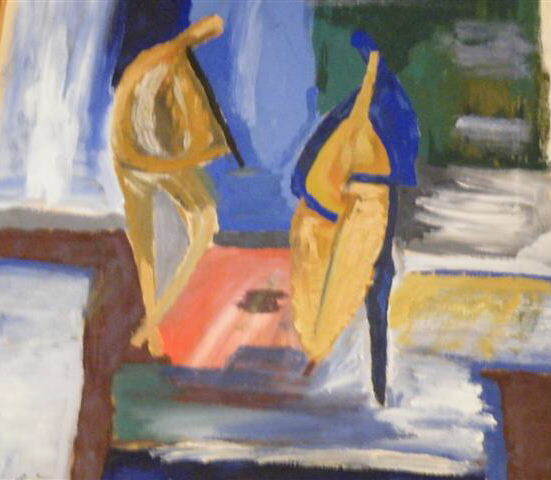 -There are two figural persons playing music in the middle of the paintings composition which does not follow any type of particular order. 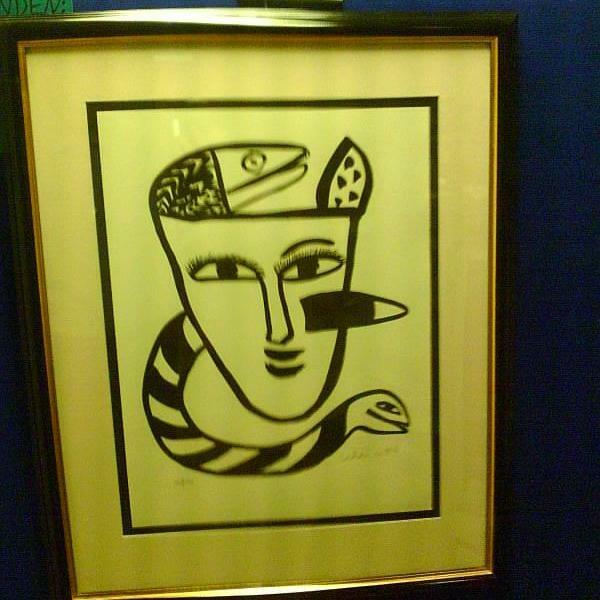 Hilding Linnqvist was influenced by naivism,fauvism and cubism. Provenance: previous owner: This painting has been bought in in Dalecarlia by the owners of the painting and previous owners have not been investigated by them. The very thin framing appears to be the artists original transport/exhibition-frame used to protect the painting. Size: 17,48 x 19,76 inch (18,46 x 20,79 inch including frame). 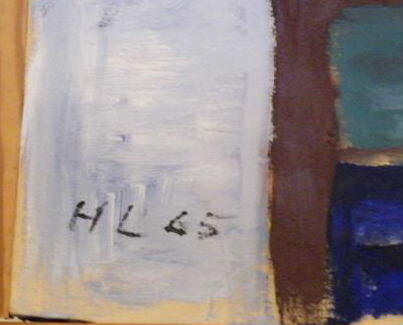 The painting is monogram signed lower left: HL -65. Hilding Linnqvist used many different types of signing and this type of signing with separate letters has been found. The perhaps most known monogram sign of Hilding Linnqvist is one in which he writes the two letters H and L together: On an exhibition in the 1950ths a french art critic remarked that Linnqvists monogram sign was in very close similarity alike the signing of Henri Laurens which made Hilding Linnqvist to change his monogram after this occurence. Gallery JT Ltd www.galleryjtltd.com does not allow copying of images and text: -See information about copyrights! Priceinformation Hilding Linnqvist: Original oil has reached above the price level one million Swedish crownes. 1.Professor in fine arts Ragnar Josephson and professor in fine arts Alf Nyman who both have participated in the book: VOR TIDS KUNST OG DIGTNING I SKANDINAVIEN which contains extensive information about modern art in the Nordic countries. Other information given about the artist Hilding Linnqvist is common known knowledge about the artist. According to art historians and professors the best period of Hilding Linnqvist was the 1960ths. The painting which are now being sold by Gallery JT LTD is painted year 1965 and the motive is probably from one of Hilding Linnqvists many travels abroad or works from Stockholm. Since the painting is signed -65 it is intresting to look for descriptions of Linnqvists art after 1960: Many of his later works are also counted as his very best. One of Linnqvists most famous paintings ever are called Villa entrance at the lake of Garda and this painting is painted in 1968 and is owned by the Modern museum of Arts in Stockholm. Hilding Linnqvist is represented in the Modern museum of arts in Stockholm and Prince Eugens Waldemarsudde, Stockholm and also the National museum of arts in Stockholm as well as in the city hall museums of Malmo and Norrkoping and Jonkoping in Sweden. Hilding Linnqvist is also represented abroad in the USA and in Germany.